There are three critical calf periods. The first period around calving includes the cow, environment, and the whole area of colostrum management. 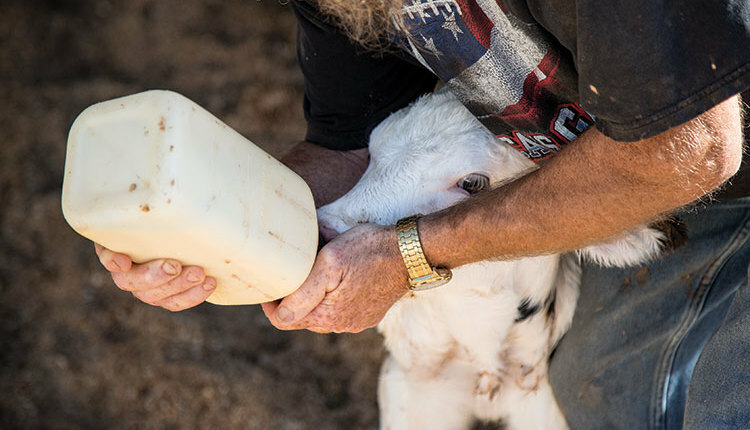 You can read more on that in the February 10, 2018, Hoard’s Dairyman article, “What makes colostrum different?” The second period is during the first two weeks of life when most calf diarrhea and deaths occur. The success of this second critical period is directly related to the first critical period. 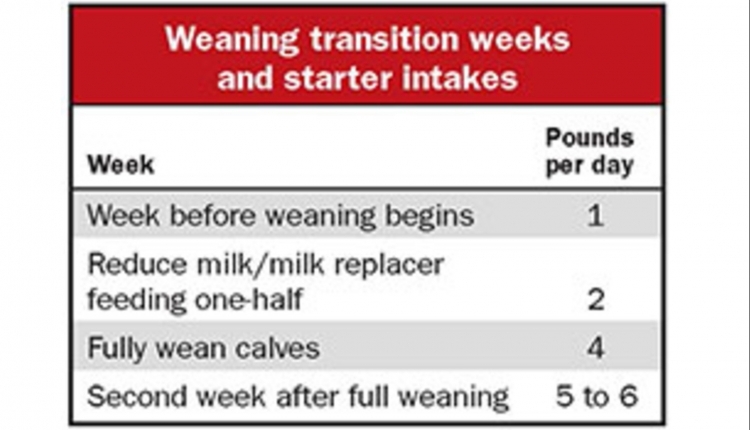 The third critical period is the weaning transition — two weeks before and two weeks after full weaning. I think this final period is the biggest unrecognized problem in many calf operations. 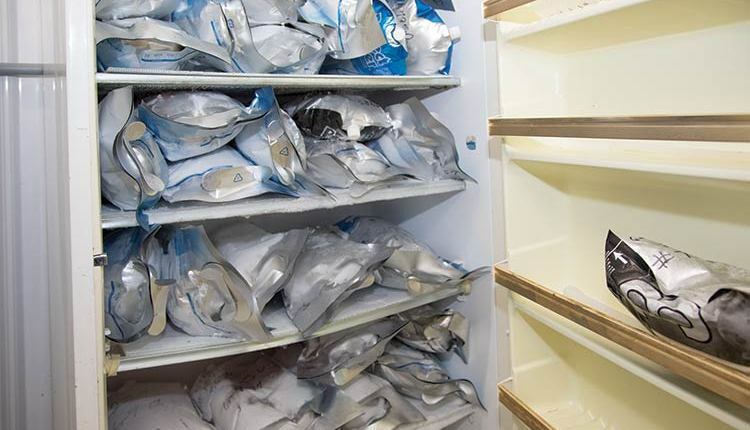 As higher amounts of milk and milk replacer are being fed throughout the nursery phases, this period becomes more critical to manage. 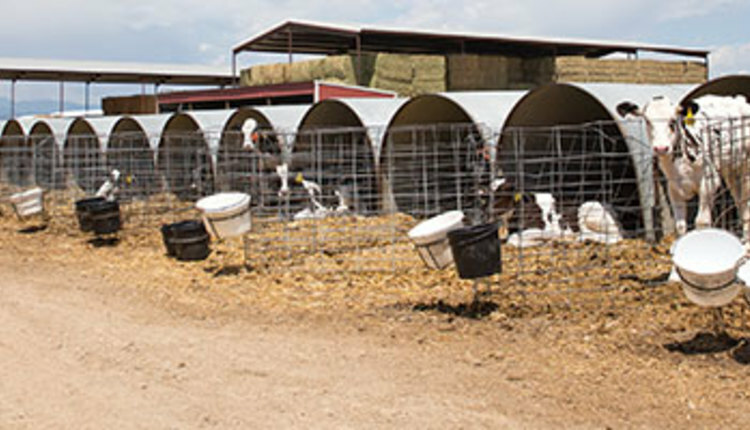 When more than 6 quarts daily (the U.S. average according to 2014 NAHMS, National Animal Health Monitoring System, data) are being fed, starter intake may be too low to wean with a simple one week at half that full feeding level. The issue is that if starter intake is not adequate for a full two to three weeks before weaning begins, then rumen development will not be adequate either. But, you cannot see the insides of the calf’s rumen to see how well developed it is before weaning. Let’s focus on a few key points. It takes detailed data to detect what is happening during this period. In a previous Hoard’s Dairyman article titled, “Win at weaning; jump-start the rumen” (October 10, 2018), I shared some newer studies which showed reduced intake, daily gains, feed efficiency, and digestibility of the starter when milk or milk replacer solids that were fed before weaning exceeded 1.5 pounds daily. The reason for this is the inverse relationship between solids fed in the liquid and starter intake. For each 0.5 pounds more solids fed, starter intake declined by 0.3 pounds based on a Penn State summary of published calf studies. Thus, if solids in milk are fed at 2 pounds or more versus 1.5 pounds,starter intake would be reduced by 0.3 pounds or more daily. That may not seem like much, but since starter intake would normally double each week, that could set back weaning by a week or more. An older German study with transition cows found it took about two to three weeks for rumen tissue to transition with the level of intake and ration change both before and after calving. I think it would be similar for calves with the level and length of starter intake. I think starter intake needs to be averaging at least 1 pound daily before the weaning process begins. Since rumen development is the key, so is the nature of the starter. When the calf rumen is not yet functional, it does not process hay or forage well. Some may say to feed a low level of forage with a pelleted starter, or a texturized starter as it really makes no difference. 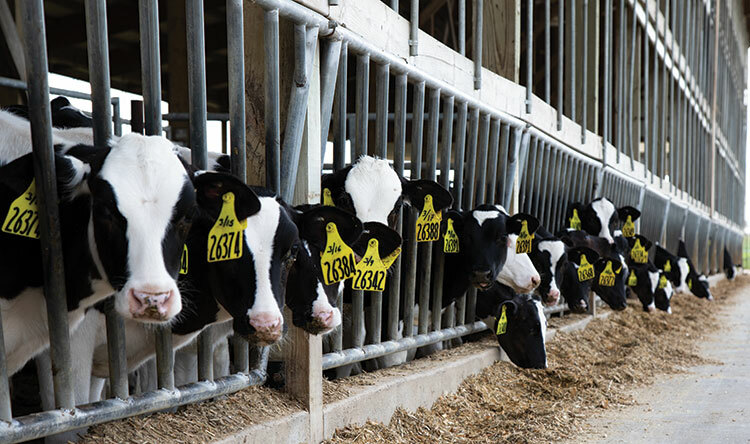 We must realize the kind of feed consumed does impact rumen development. A series of British studies in the 1960s showed that the more forage was fed to young calves, the lower their daily gain was, the less rumen papillae developed, and there were more gut contents, too. So, that was a triple negative effect. 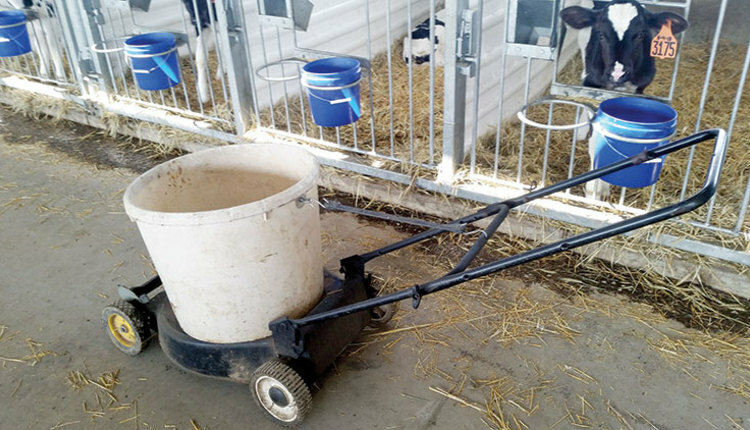 A more recent Canadian study used what was called a “texturized” starter, feeding starter alone or pairing it along with chopped orchard grass hay. The commercial starter had 14 percent flattened barley, 13 percent flattened oats, and 10 percent steamed corn. That total was 37 percent texture, but all grains were processed. The table below reveals some key data from that study. First, the low rumen pH with the “texturized” starter fed alone shows there was not enough texture in that diet. Additionally, five bull calves on each treatment were slaughtered. From postmortem measurements, calves that had access to hay in addition to the starter had 10.4 pounds more rumen fill. Since calves on both treatments weighed the same, that means the calves with hay access gained 10.4 pounds less true body growth. So how does all of this work out in practice? In the 2018 NAHMS calf study reported in the October 2018 Journal of Dairy Science, Holstein heifer calves comprised 90 percent of all calves on 104 dairy farms and gained 1.6 pounds daily before weaning at 65 days of age. From then until 90 days of age they only gained 1.3 pounds. Clearly, there was not a good weaning transition program on these dairy farms. Sometimes I get to learn how well my recommendations have worked on dairy operations. A few years ago, I reviewed calf operations on a dairy farm in China. I had met the manager about five years before when he was managing another Chinese dairy farm. I had visited that farm before, and made several key calf program recommendations. Five years later, he told me how well those recommendations had worked. A few years ago, a large calf and heifer operation manager that I have visited in the past pulled me aside at a calf and heifer conference. At the time of my visiting his operation, they had been feeding a texturized calf starter. But since, they had migrated to a pelleted starter, which also had some fines associated with it. Daily starter intake by the end of two months was only 3.5 to 4 pounds per calf. And body weights at the end of two months did not double from birth — which is the goal. After reading some of my more recent comments and information about differences with pelleted and texturized calf starters, they changed back to a texturized calf starter. Now, the calves were eating 6 to 8 pounds daily at the end of two months, and birth weight had doubled plus another 10 pounds at that time. This past year, I was at a conference in Europe. At break, an attendee introduced himself to me. He was a veterinarian in a nearby country who had some dairy farm clientele, and he was a veterinary college faculty member. He told me how useful my articles and recommendations had been for him. One example he cited was with a dairy farm where they extensively revamped the calf and heifer program. Over the next three years, the rolling herd average went from 17,600 pounds (8,000 liters) annually to 24,200 pounds (11,000 liters) — a 38 percent improvement. I have seen some cases where calf and heifer program changes have shown up in the rolling herd averages over just six months after a significant change, but in most cases, it takes the full two-year growth period, and the first lactation to show the benefits.